UVV was delighted to lead a village koliada workshop! It was the first time that several UVV members united to form such a unique workshop for the public. Koliada is a beautiful winter ritual that is prominently celebrated in Ukraine and in the diaspora alike. It is a pagan-turned-Christian Christmas season tradition of walking from home to home greeting people. The carolers bring holiday cheer and bestow blessings upon the dwellers through song and spoken verse, and receive gifts in return from generous hosts. Brian Dolphin, Laryssa Czebiniak, Anna J Witiuk, Natalie Oshukany and Ulana Pryjmak immersed participants in two hours of joyous koliada. They taught some of UVV's favorites, many of which were learned directly from singers and folklorists from Ukraine. These are not your traditional Ukrainian carols and are a wonderful embodiment of village spirit! This workshop also shared details about the ritual of koliada, including costumes, role-playing, props, and more. The Poltava region's Kriachkivka village is famous for its heartbreaking melodies sung in three-part harmony. These songs, sung by the village's ensemble "Drevo", have been collected by singer Mariana Sadovska, and groups DakhaBrakha, Kitka, Bozhychi, and Kurbasy. Nadia Tarnawsky has spent a great deal of time with Nadia Rozdabara and Nina Reva, the remaining two members of Drevo, and will teach lyrical songs and a koliada (winter carol) during this workshop. It was an intimate group of 20 participants that got a good taste of how to use their voices village style! We got in touch with our “inner goat” and had 1:1 training with Nadia. As she went to each of us, she taught us from where our sound is coming, and showed us how to get it where it can reach its fullest potential. Her selection of songs was joyful and challenging. It was a true blessing to have her teach us on Sunday afternoon! Nadia has recently returned to the United States after completing a year of research, study, and teaching in Ukraine as a recipient of a Fulbright Award. She has studied Eastern European singing techniques for nearly three decades and has taught Ukrainian village style singing in workshops for the Ukrainian Catholic University in Lviv, Ukraine, the Center for Traditional Music and Dance in New York, Village Harmony, Folk Camp Canada, and Kitka Women's Ensemble, among others. In 2011, she received a Traditional Arts Fellowship from Artist Trust and an Artist Support Residency from Jack Straw Productions. Nadia sang with Ensemble Hilka of New York in commemoration of the 25th anniversary of the Chornobyl disaster in Ukraine. This workshop was a treat! Kurbasy taught us their artistic take on traditional Ukrainian songs, various vocal techniques, and revealed contemporary connections to an archaic past. We were also honored to have three instrumentalists accompany the singers, which made their teachings and songs come alive even more. Lviv, the eons-old Carpathian hub, holds one of Ukraine’s centers of culture. Around this nucleus, spheres of tradition and innovation spin, collide and reform. The idea of culture as a cosmic living organism is central to Kurbasy, whose folk-based multimedia performances vibrate in tight vocal harmonies, resonant lyrics, culturally unique instruments, and beautiful visual imagery. Conceived and directed by actor-singers Maria Oneshchak, Myroslava Rachynska, and Natalia Rybka-Parkhomenko, Kurbasy theatrically explores Ukraine’s rich trove of calendar song cycles. Kurbasy is an avant-garde musical project of the renowned and progressive Les Kurbas Theatre in Lviv, Ukraine. Starting in 2008 as an informal vocal gathering during rehearsals for other theater productions, Kurbasy now integrates the sounds of Ukrainian instruments – zither, cymbals, tambourine, drums, with violin and contrabass. The theatrical background of the group is a core component of Kurbasy's aesthetic. The music they perform is tied to, celebrates, and renews the rituals, memories, and cycles of Ukraine and its people. Kurbasy was in the USA from October 21–November 18, performing and conducting residencies from coast to coast as part of Center Stage (centerstageUS.org), a program of the U.S. Department of State. This workshop explored different stylistic techniques, vocal ranges, and melodic distinctions of village songs from the Polissia and Poltava regions of Ukraine. We will learned a strident, two-part vesnianka (spring song) that has a plaintive, ornamented solo with all singers landing in powerful unison to call in the spring. We also learned a richly polyphonic lyrical song with three-part harmonies with wide ranges, a warmer tone quality, and great emotional expressiveness. Together, these songs showcased the playful confidence, diversity and emotive presence of Ukrainian vocal music. Shelley Thomas, currently of Brooklyn, NY, is a professional vocalist, oudist, voice coach, percussionist, and composer specializing in Eastern European and Arabic styles. She has taught workshops, recorded, performed and toured nationally and internationally with notable world music artists including Yo-Yo Ma’s Silk Road Ensemble, Hassan Hakmoun, the New York Arabic Orchestra, Vlada Tomova’s Bulgarian Voices Trio, and Black Sea Hotel. Performances include festivals such as Lincoln Center Out of Doors, Vancouver Island Music Festival, and Abu Dhabi Festival. Years ago Shelley performed with both Ukrainian Village Voices and its original group Ukrainian Women’s Voices. She has also intensively studied the ancient and rare folkloric songs of the Chornobyl region with Yevhen Yefremov, an acclaimed ethnomusicologist from Kyiv. Under his musical directorship, along with Maria Sonevytsky and others, she toured the East Coast with Ensemble Hilka. They released The Chornobyl Songs Project album on the Smithsonian Folkways Record label. She was also a lead soloist in Virlana Tkacz’s multimedia theater piece, Fire Water Night at LaMaMa Theater, which thematically centered around ritualistic Kupala songs of early summer and featured musical collaboration with Toronto-based Lemonbucket Orchestra. Shelley received a development grant in 2012 from the Alliance for California Traditional Arts to lead workshops on Chornobyl songs for the San-Pedro based folk group, Zhena Folk Chorus. Shelley has built a knowledgeable repertoire of year-round seasonal songs, including Vesnianky, Kupala, Harvest, and Koliada, as well as wedding songs. As we yearn for spring's arrival, this workshop focused on two genres of songs with gorgeous group harmonies. Natalia introduced lyrical love songs from villages in central Ukraine that are suitable to sing this time of year. These songs are sung in areas where people gather together, relaxing after the day's work in the fields has finished, or around a table at a festivity. We also learned joyous spring melodies. In early spring (vesna), vesnianky are sung in open, outdoor spaces to bring blessings and encourage a new season to flourish. Together we will call for fresh green grass, blooming flowers and budding trees, warm weather, and favorable conditions for farming. An element of magic and otherworldliness is felt while singing this type of ritual folk song! 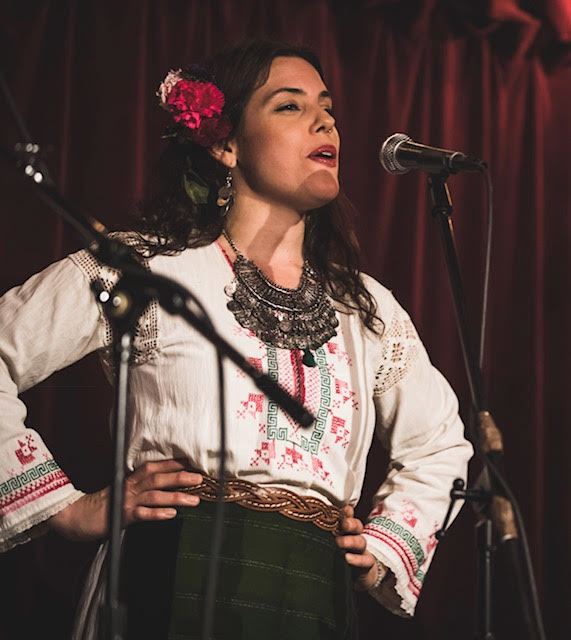 A Kyiv native, Natalia shares her hands-on knowledge of Ukrainian songs and traditions. She joined Ukrainian Village Voices in 2015 upon her arrival in NYC, but her experience with this music began when she was a little girl. In Ukraine, she grew up listening and singing along with her Baba Paraska and, upon turning 6, she became a part of the Ukrainian folklore dance and song ensemble Zernyatko. She traveled the world with this group, giving concerts at festivals and on TV shows for nearly 10 years. Natalia has continued appearing on stage, performing Ukrainian songs and dances on various occasions and teaching as well. At this chapter in life, she defines herself as a professional Mama, singing daily to her three kids, and is excited to call forth spring together with us! We delved into rural Ukraine and connected with the deep wisdom of Ukrainian folk songs. As we practiced singing in the polyphonic style with Inna Kovtun, we also learned about the history of everyday life and leisure of the Ukrainian people she has met. For nearly 20 years, Inna has traveled to picturesque villages on folklore expeditions, gathering songs, dances, and rituals from women and men with the goal of preserving the variety in Ukrainian folk culture, much of which is vanishing with the passing of this generation. We were swept away by Inna's beautiful voice and expertise! We learned several ritual songs and felt more inspired with every passing minute. Kyiv's Inna Kovtun is an ethnographic-folklorist, educator, performer, as well as a researcher and collector of Ukrainian folklore traditions. She is the highly regarded musical director of the village folk group Rozhanytsia, as well as a soloist in the folk-rock group Astarta. Together with Rozhanytsia she has released several albums of authentic village songs. The group aims to perform the songs in a way that replicates regional vocal traditions, including execution of sound and local dialect. Inna has performed and given workshops all around the world, including in Germany, Italy, Great Britain, Canada, Russia, Lithuania, Latvia, Estonia, Azerbaijan, Czech Republic, India, and others.